It looks as though Autumn is on its way, knee deep in leaves now and battered by various stormy winds and now rain. However we all play on, in denial that we may have said goodbye to our wonderful summer! However, the diary was right and this week it was our Autumn Meeting and over 30 of us played in fairly windy conditions for the Chris Leary Chalice. It was fantastic that Jenny Feaver was the winner with 37 pts. Jenny told us all that the force 9 gale 'suits her game'. Congratulations Jenny, a very popular and worthy winner! A number of other trophies, cups and prizes were presented after a wonderful lunch and I would like to congratulate everyone. Good to see some of our lovely 9 holers too. If you weren't there to collect your prizes then please try and make it to the AGM (Nov 1st 7pm) when there will be more presentations...and FREE wine!!!! 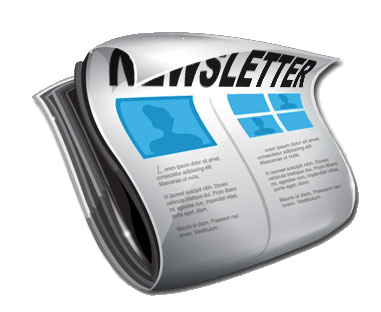 It is a chance to find out what is going on next year as well as to celebrate this year. The raffle held yesterday in aid of the Essex and Herts Air Ambulance raised in excess of £200, thanks to all who donated prizes and for your very generous donations to the charity. 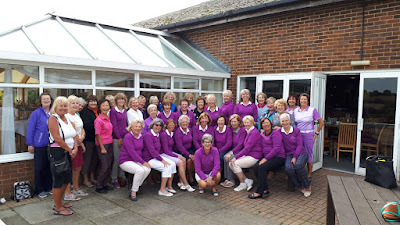 In addition to the prize giving we took some great pics of the Ladies Section sporting the new colours, great to see so many Ladies supporting the day and wearing new sweaters. If you feel the need to get one please see the guys in the pro shop for details. As you are all aware Captains Day will now be held on Saturday Nov 10th - still lots of space and weekend ladies don't forget you can come too!! !The sign up sheet is on the Club Board and the more the merrier. From next week I will be selling the raffle tickets for that day. The prize is a Years FREE 7 DAY membership of the club so it's got to be worth £5 a ticket. There is a list up on the Thursday board of those ladies eligible for entry into the Kathy Dale Medal Final and the Lauren Pitcher Stableford Final. 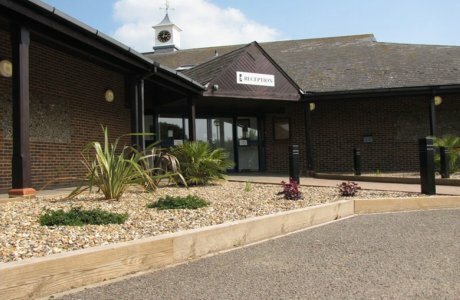 Please sign in on the computer for these competitions in October but if you are not eligible then on each occasion there is a separate Medal and Stableford Competition. 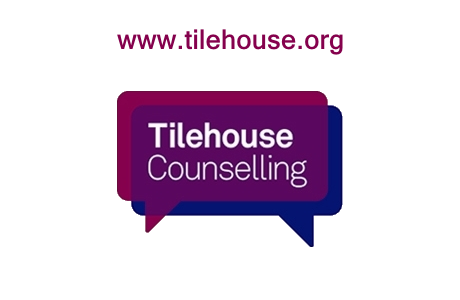 Any queries please contact Lin Goodey. Whilst we are on the subject of Kathy and Lauren - good luck girls this coming week in the finals of the Yonex Pairs at the Buckinghamshire Golf Club. Christmas Update - Jackie Reid has arranged for a Christmas Wreath Workshop at the club again this year - date for your diary is Tuesday Dec 4th 1.00-3.30pm. When Jackie returns from holiday she will put the details and sign up sheet on the board. 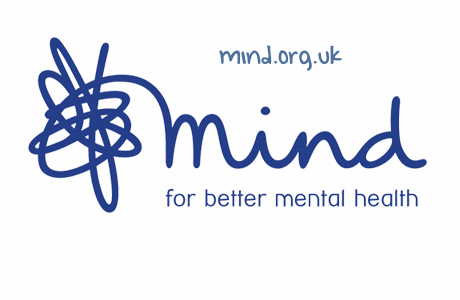 Please also sign up if you are interested in meal out on Thursday 13th December. I will let you have further details in due course but I think there are enough names on the board to get something booked away from the Club party night this year. Looks like the forecast is drier and less windy for the week ahead so get out there and enjoy some Autumn golf. Another busy week for us all on the courses of Hertfordshire! We played a Friendly away at Knebworth on Tuesday. 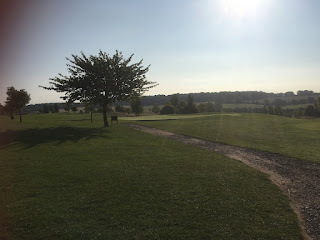 The Knebworth ladies were great hosts, the weather was kind (at least until the end) the course was in very good condition and the food was fab. All the matches were close and went to the 17th - the final result was 3 games to 2 to Knebworth. A big thank you to all the CD ladies who played so well! Several of our Ladies played at Redbourn this week in their Open and had a fun time. I don't think they won the golf but it appears they did well on the tombola!!! Pat and Jackie went to Oak Park to play in the Champion of Champions. They had a good day out on a tricky, undulating course!! Congratulations to Lauren and Angela H who won their respective divisions in last weeks Medal. It is the Autumn Meeting on Thursday this week. It is great to see a full house on the golf course and for lunch and prize giving in the afternoon. Please note that as there are so many of us I have rescheduled a LS photo after lunch (Captain forgot her jumper this week!). Wear your Foxglove jumper if you have one... but ALL welcome for the photo shoot! Please pay Pat for the Autumn Meeting if you haven't done so already - £18. Also looking ahead to the next season of Pearson matches which is approaching fast, we will be making a few changes to how the teams are selected and how the squad works as a whole. Hopefully these changes will make us more competitive and more successful in this competition. We have great talent as golfers both home and away but feel that some small changes will bring us all benefits. Please watch this space and your email boxes for further info as it becomes available. It appears that the lovely summer of 2018 is continuing into the early autumn with great weather for low scoring golf! Last weekend Kathy D won the Weekend Medal with a nett 67, followed up by a nett 68 in the 2nd round of the Eclectic Cup on Thursday. Congratulations Kathy on a good handicap cut too! 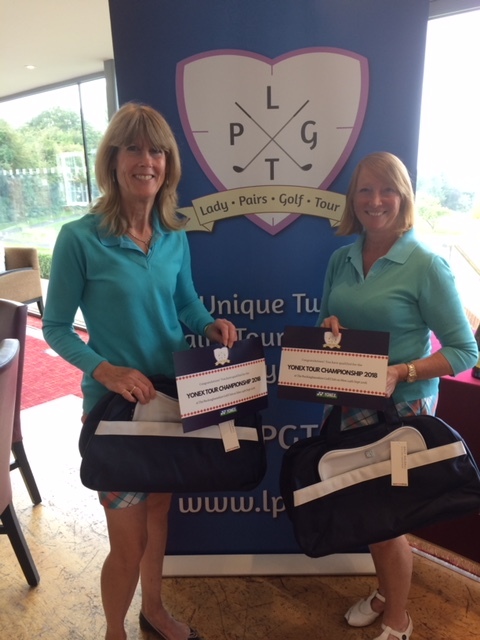 Kathy is obviously on fire at the mo and along with Lauren they entered the Yonex Ladies Pairs competition "The Hertfordshire Crown" held over 2 days and 36 holes at Letchworth and Knebworth GCs. There were lots of fantastic goody bags and prizes up for grabs and Kathy and Lauren scored 40 points on day 1, followed up by 41 points on day 2. With that overall score of 81 points they were thrilled to come 3rd (pipped from 2nd on c/b) They received a glass trophy, a lovely golf holdall and have qualified to play in the Yonex Tour Championship 2018 at The Buckinghamshire Golf Club on Monday 24th Sept. Well done girls, a fabulous result and this competition is certainly one for the diary next year...good luck on 24th! On Sunday 9th Pat W and Jackie R are representing Chesfield in the Crown Champion of Champions at Oak Park. 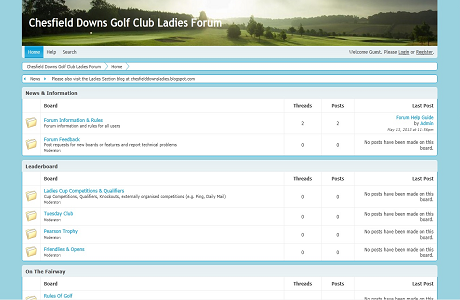 Hope you had a great day ladies and brought the prizes home...there will be a report in next weeks newsletter! This week brings a Friendly match away at Knebworth on Tuesday, good luck team! Jean Ray reaches a 'significant milestone' in her life this week and after golf on Thursday she has kindly arranged tea and cakes for us to celebrate with her. Congratulations Jean and bring your best voices on Thursday! I am hoping to hold a raffle at the Autumn Meeting on 20th Sept so if you have any suitable prizes (that you would like to win!!) then please place in the box in the changing room. 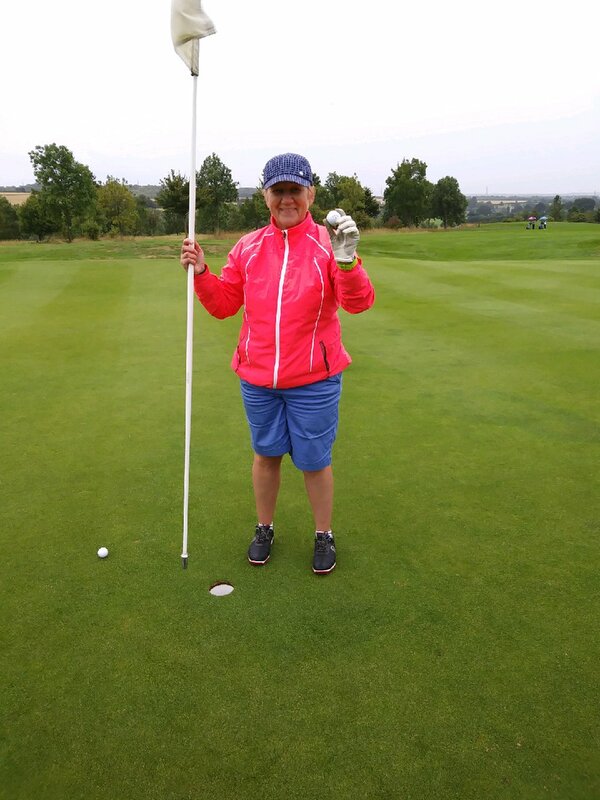 Certainly Nikki B did, a fantastic hole in one last weekend at the 9th. Well done!! The other ball in the pic belonged to Linda Brown who scored a birdie - very close! The first round of the Eclectic Cup was played on Thursday and Virginia was top of the pile with a gross score of 80. This excellent score lead to Virginia getting to the elusive single figure handicap. Well done...In spite of that there is still all to play for in round 2 this week. Don't forget to hole out on every hole to make both rounds count! There is a handicap prize too. Pat and Jackie will be taking part in the Crown Champion of Champions day at Oak Park next weekend. Good luck Ladies, enjoy the moment! I hope Crown treat you nicely! Hope to see you all during the week.